Bacterial mastitis is the most common variety of mastitis and is often caused by Staphylococcus aureus. Chronic mastitis is usually caused by tuberculosis, syphilis and Mondor's disease. A 33-year-old female presented with lump in the right breast for the past two years with pain for the past 15 days and discharge for the past two to three days. There was no history of diabetes mellitus, hypertension, bronchial asthma and tuberculosis. On examination, the lump measured approximately 9×5 cm in size with a discharging sinus just lateral to the areola. No regional lymphadenopathy was noticed. A clinical diagnosis of "Lump in the right breast with sinus probably due to tuberculosis was made. The lump was excised and per-operative sample grew Salmonella paratyphi A in culture. She responded to Ceftriaxone and unnecessary use of anti-tubercular drugs could be avoided. In chronic mastitis and breast abscess Salmonella species should be considered as one of the etiological agents. Non-lactational breast abscess occurs in patients with duct ectasia and periductal mastitis. Anaerobic bacteria are the cause in the majority of cases. Although a few cases of breast abscess due to Salmonella More Details have been reported in the literature, it is a rarity. Hence we report this case of chronic non-lactational breast abscess due to Salmonella paratyphi A. A 33-year-old female presented to the outpatient department of Surgery with history of lump in the right breast for the past two years with pain in the lump for the past 15 days and discharge from the lump for the past two to three days. Patient was apparently normal two years back and later noticed a lump associated with pain in her right breast that was circular, measuring about 5 cm. She consulted a doctor and the pain was relieved by medication. Since 15 days, she had noticed pain in the lump again, continuous in nature, pricking type and non-radiating. No variation was associated with the menstrual cycle. Patient complained of discharge from the lump for the past two to three days, purulent initially, later mixed with blood. There was no history of similar swelling in the other breast; no history of fever, and ulceration of the lump; no history of diabetes mellitus, hypertension, bronchial asthma and tuberculosis. Patient was a middle-aged female, moderately built and nourished, alert, conscious and co-operative. No pallor, icterus, cyanosis, pedal edema and lymphadenopathy was seen. All other parameters were within normal limits. On local examination of the right breast, a lump was noticed that was oval in shape measuring approximately 9×5 cm in size, non-tender, and there was no focal rise in temperature. The surface of the swelling was smooth, firm in consistency with a well-defined margin. A discharging sinus was noticed just lateral to the areola with scanty purulent discharge. There was no regional palpable lymph node enlargement. Other systems examined revealed no clinical abnormality. A clinical diagnosis of "Lump in the right breast with sinus (? Tuberculosis)" was made. A swab collected from the discharging sinus was sent to the microbiology laboratory which yielded the growth of a few colonies of Pseudomonas which was regarded as a surface colonizer and the diagnosis of tuberculosis was still considered but Zeihl Neelson's staining did not reveal any acid-fast bacilli. Chest X-ray and ultrasound scanning of the abdomen did not reveal any abnormality and hence other systemic abnormality was ruled out. Ultrasound scan of the breast revealed an organized collection in the right breast in the lateral aspect extending anteriorly up to the skin surface in the periareolar region with a few enlarged lymph nodes in the right axillary region. Human Immunodeficiency Virus (HIV) antibodies and Hepatitis B surface antigen were negative. The patient was then posted for excision biopsy after taking written consent. The lump was excised and per-operative sample was sent for culture and sensitivity [Figure 1]. The sample was inoculated onto both MacConkey's agar and Blood agar plates and incubated at 37°C for 48 h. MacConkey's agar yielded non-lactose fermenting colonies which were processed as per the standard protocol. The biochemical reactions put up depicted the reactions of Salmonella paratyphi A. The identification was confirmed by doing slide agglutination test with specific antisera (O-2). Antisera were obtained from Omega Diagnostics Ltd. The antibiogram showed that the isolate was sensitive to Ciprofloxacin, Cefotaxime, Cotrimaxazole, Ceftriaxone and was resistant to Nalidixic acid and Ampicillin. The sample was also processed for mycobacterial culture on Lowenstein-Jenson (L-J) medium that was incubated at 37°C for eight weeks. Culture on L-J medium did not yield any growth. The sample was also negative for acid-fast bacilli in the direct smear. Ten ml of blood sample was collected with aseptic precautions for culture, inoculated onto brain heart infusion broth and incubated for ten days with alternate day subculture to look for growth of Salmonella. Culture did not yield the growth of any bacteria after ten days of incubation. The patient's blood sample was also tested for antibodies to Salmonella by Widal test and the antibody titers were TO < 1 in 40, TH < 1 in 40, AH= 1 in 160, and, BH < 1 in 40 suggestive of a chronic infection with Salmonella paratyphi A. Widal antigen was procured from Span Diagnostics Ltd.
Based on the culture report, the patient was started on Ceftriaxone and treated for two weeks and unnecessary use of anti-tubercular drugs could be avoided. After three weeks the patient was reviewed and it was found that the discharging sinus had healed up with no fluid/pus collection. Although Salmonella isolated from different tissue sites have been reported in the literature, very few (only nine cases were found in the literature search) cases from breast abscess have been recorded. S. paratyphi A is known for milder form of enteric fever with not many complications associated. This is the first case of breast abscess due to S. paratyphi A. Also, this patient did not have any present or past history of illness suggestive of enteric fever. Hence we thought it is worthwhile reporting this rare case of breast abscess due to S. paratyphi A. Following are the case reports of Salmonella isolated from different tissues by different authors. Raghunatha et al. have reported a case of injection abscess due to S. typhi. Sinha et al. have reported a case of Salmonella typhi isolated from splenic abscess. Hung et al. have reported pelvic abscess caused by Salmonella. Barrett et al. have reported "a case of breast abscess: a rare presentation of typhoid". MK Lalita et al. in their study from 6250 cases of Salmonellosis More Details have reported soft-tissue abscess in skin (7), parotid (2), thyroid (3), breast (1), inguinal node (1), bronchial sinus (1), and injection site (1). There are innumerable reports on isolation of Salmonella from various sites other than the breast. Only few articles have been reviewed here. Because of the rarity, this case of breast abscess due to Salmonella paratyphi A is reported. With culture report, unnecessary use of anti-tubercular drug could be avoided. My sincere thanks to Prof. G.S.Vijay Kumar, HOD of Microbiology, who permitted me to work on this case. 1. Russel RC, Williams NS, Christopher JK, Bulstrode. Bailey and Love's Short practice of surgery. 24 th edn, Chapter 55. London: Arnold; 2004. p. 830-1. 2. Shenoy R. Manipal Manual of Surgery. 2 nd ed. New Delhi: CBS Publishers; 2005. p. 283. 3. Brncic N, Gorup L, Strcic M, Abram M, Mustac E. Breast abscess in a man due to Salmonella enterica serotype Enteritidis. J Clin Microbiol 2012;50:192-3. 4. 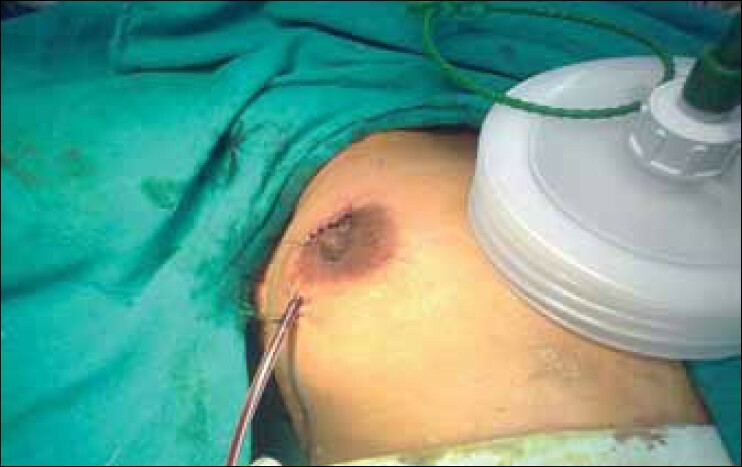 Viswanathan R, Shah Ah, Nagori IF, Gupta MK .Salmonella typhi in breast abscess Case reports. Bombay Hospital Journal. 2003; 45(3). Available at http://www.bhj.org/journal/2003_4503_july/salmonella_452.htm accessed on 07.04.2012. 5. Al Benwan K, Al Mulla A, Izumiya H, Albert MJ. Erythema nodosum and bilateral breast abscesses due to Salmonella enterica serotype Poona. J Clin Microbiol 2010;48:3786-7. 6. Singh S, Pandya Y, Rathod J, Trivedi S. Bilateral breast abscess: A rare complication of enteric fever. Indian J Med Microbiol 2009;27:69-70. 7. Vattipally V, Thatigotla B, Nagpal K, Saraiya R, Henry M, Shah AK, et al. Salmonella typhi breast abscess: an uncommon manifestation of an uncommon disease in the United States. Am Surg 2011;77:E133-5. 8. Delori M, Abgueguen P, Chennebault JM, Pichard E, Fanello S. Breast abscess with Salmonella typhi and review of the literature J Gynecol Obstet Biol Reprod (Paris) 2007;36:709-12. 9. Mahajan RK, Duggal S, Chande DS, Duggal N, Hans C, Chaudhry R. Salmonella enterica serotype Typhi from a case of breast abscess. J Commun Dis 2007;39:201-4. 10. Edelstein H. Breast abscess due to Salmonella serogroup B, serotype Reading, in a young nonpuerperal woman. Clin Infect Dis 1993;17:951-2. 11. Jayakumar K, Appalaraju B, Govindan VK. An atypical presentation of Salmonella typhi - a case report. Indian J Med Microbiol 2003;21:211-2. 12. Pegues DA, Miller SI. Harrison's Principles of Internal Medicine. Mc Grawhill pub. Salmonellosis 2008;1:957-8. 13. Ridha AG, Malbrain ML, Mareels J, Verbraeken H, Zachee P. Lung abscess due to nontyphoid Salmonella in an immunocompromised host. Case report with review of the literature. Acta Clin Belg 1996;51:175-83. 14. Arya M, Arya PK. Pancreatic abscess caused by s. typhi. Indian J Med Microbiol 2001;19:18-9. 15. Raghunath R, Ashok AC, Sridaran D, Indumathi VA, Belwadi MR. A case of injection abscess due to Salmonella typhi. Indian J Med Microbiol 2003;21:59-60. 16. Sinha S, Sharma DC, Miri B, Gupta V, Chattopadhyay TK. Splenic abscess--case report and review of literature. Trop Gastroenterol 1997;18:134-5. 17. Hung TH, Jeng CJ, Su SC, Wang KG. Pelvic abscess caused by Salmonella: A case report. Zhonghua Yi Xue Za Zhi 1996;57:457-9. 18. Barrett GS, MacDermot J. Breast abscess: A rare presentation of typhoid. Br Med J 1972;2:628-9. 19. Lalitha MK, John R. Unusual manifestations of salmonellosis--a surgical problem. Q J Med 1994;87:301-9.